Patios allow homeowners to enjoy nature in a comfortable outdoor living space. Originating from sunny Spain, patios were made to provide homeowners with a way to keep fresh and cool. Filled with plants and decorated with water features, they pleased the eyes as well as provided relief. 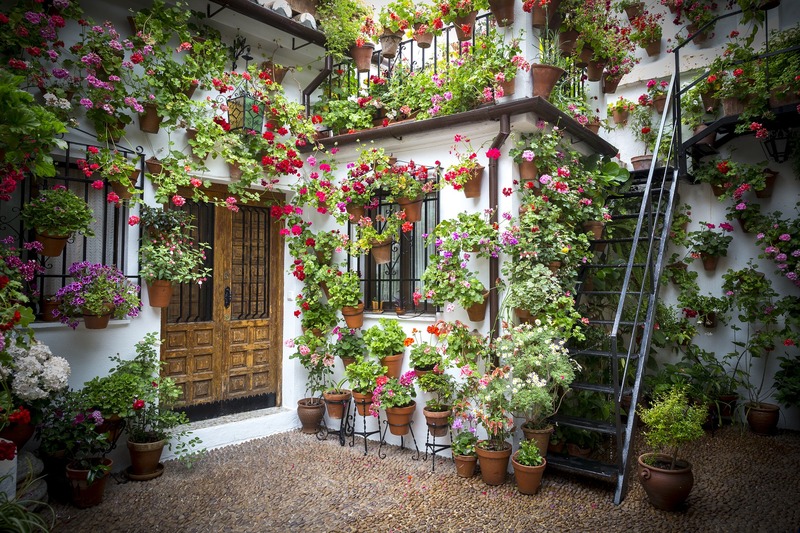 As well-loved structures in Spain, these home staples are celebrated every May during the Patio Festival in Cordoba. In this festivity, guests and tourists alike are welcomed by proud homeowners to their plant-adorned patios. As a nation that loves its gardens, the UK has adopted patios creating a new focal point for their garden. Homeowners can now enjoy tea while basking in the beauty of their well-cultivated plot. Patios can also serve varying functions, depending on how they are designed. You too can add a stunning focal point to your garden and an additional practical living space with these patio ideas. Defining the purpose of your outdoor living space will guide what features will be present in your patio. Will you use your patio for outdoor dining or sunbathing, as an outdoor play area or as an outdoor living room? The purpose of your patio will also affect where it will be placed. For sunbathing, naturally you have to place your patio in the sunniest area in your garden. For outdoor dining or as children’s play area, it is best for the patio to adjoin your home’s exterior. It would be easier to get things from the kitchen, and it would be easier to keep an eye on the children. You have a number of options where to place your patio. U-shaped and L-shaped houses provide a perfect spot for where the patio can be placed. Attached to the house, these patios usually give access to the kitchen or the sitting room. Some homes place them at the front, using them as an alternate receiving area. For those who want an outdoor living space almost as big as the home, a wraparound patio is a perfect solution, extending multiple rooms to the outdoors. The master bedroom can be opened to an outdoor relaxation area. One can get out of the kitchen and dine alfresco. Families can entertain more guests and open the living rooms to the gardens. You can also have a detached patio for a private haven a few steps away from home. You can optimise the natural features in your garden with a pond or a sloping plot by placing your patios near them. Beside a pond, a patio will be cooler while on a sloping area your patio can have layers for different functions. Weatherproofing your patio presents various design ideas. Starting from the cover, you can choose among patio roofs, shades or awnings for attached patios, and pergolas, canopies, and gazebos for detached patios. The use of fabric covers adds a soft silhouette to patios while fixed structures give those resting in the patio a secure feeling. Matched with the home’s roof and drapes, patio covers can give a cohesive feel to the whole look of the house. Consider furniture that can stay out in the English weather. Wood and wicker furniture are great options for a natural relaxing look, just make sure that the furniture you buy has been treated to withstand frequent rains. Metal furniture always adds an elegantly classic feel to the outdoors. Powder-coated metal furniture is usually the best option as they are better protected from varying weather conditions compared to furniture with a wet paint finish. Cushions add a comforting and welcoming look to any patio. Just make sure that both the cover and filling are waterproof and try to find fade-resistant fabrics. Adding a fire pit, a fireplace or outdoor heaters will allow you to use your patio well into the start of the cooler months. Fire pits and fireplaces serve an aesthetic function as well as being the centrepiece of the patio. Patio flooring should be a major consideration as it sets the tone for your whole patio. Wooden decks are practical for many sites as they give a level surface, safe for most to walk on. Choosing hardwood over softwood can give your patio a slicker look, and you can choose among richer colours. With paving, you will have a tremendous amount of options for materials, all giving a sophisticated look. Choose from different coloured limestones, bricks, flagstones and cobblestones and have them masterfully arranged into beautiful patterns. You can consider a mixture of pea gravel and pebbles, or have them in between widely-spaced stones. You can even use a mix of materials and have a mosaic created. Transform your patio at night with outdoor lighting. If you have pergolas, trees and tall shrubs, festoon lights or fairy lights can add a romantic glow to your patio. Tastefully added, your garden will look like a scene from a fairytale. For a modern look, deck and ground lights, garden spotlights and post and bollard lights are great options. They can highlight key designs in your patio and are great features for a safe stroll around the garden at night. Themed lighting fixtures are also a great idea. The classic lamppost look is great for English gardens while a Mediterranean garden can have intricately patterned and colourful lamps. Create a seamless transition from the indoors to the outdoors by adding ornamental plants to your patio. Add potted evergreens like the aromatic bay laurel or the cider gum with its silver-blue coloured leaves. Decorate table tops with a basket of sweet smelling heather, grape hyacinth in a wooden planter, crocuses in earthenware pots or daffodils in a rattan basket. Consider hanging baskets filled with trailing petunias or a mix of different coloured lobelias. They can be hanged in key places such as exterior walls, roof edges of a patio or under trees that give shade to a patio. Creating a patio has endless possibilities. With Oakleigh Manor’s team of multi-disciplined professionals, impeccable standards and workmanship guarantee, we can make your vision come to fruition. Visit or call us on 0800 023 1310 so that we can discuss what you have in mind.